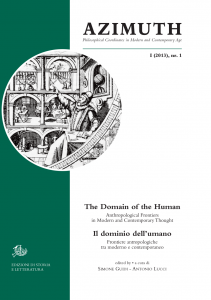 The current issue looks into the concept of Man and in particular at the anthropological domain that this notion has represented at different times in the history of modern and contemporary western thought. It does this, however, by focusing on its cut-off points, where questions have revealed a fundamental instability at the root of the very concept of “human’’, thus attempting to show that every “theory of human nature’’ must by its very nature look beyond human nature as it identifies and ‘brings out’ to the point of alienation the inner grammar and constitutive logic of that combination of forces commonly known as ‘Man’. In mapping out a sketch of the elements that make up the setting for this problem, we have set out to give this collection the structure of a round trip. As our starting point for this selection we have taken the mechanistic and naturalistic revolution in the theory of human nature which, starting from Descartes in the heyday of the modern era, for the first time assigns to physiological investigation autonomous prerogatives in defining the human, bringing in a wide range of anthropological paradoxes concerning the dividing lines between Man, machine and animal. These paradoxes were to push philosophical reflection itself, with Kant, towards the new shores of a moral and pragmatic theory of human nature which was to be characteristic of the whole second part of the modern era and which is richly dealt with in this volume. The same paradoxes had to be faced again with the arrival of Darwinian evolutionary theory, when they had to be integrated with the problems that had arisen in the moral and idealistic thinking of the early 19th century. So by closing with the concept of the “post-human’’, the return of this selection to its starting point perhaps brings us to the point of connection between the two poles around which philosophical reflection on human nature has revolved – nature and spirit – and the culmination of a duality that seems to us to identify and delineate the domain of the human that western thought has been mapping out from the early 17th century until today. Hoping you enjoy the read, we invite you to look forward to the next issue of Azimuth, due in October 2013, dealing with Aesthetics and Politics.